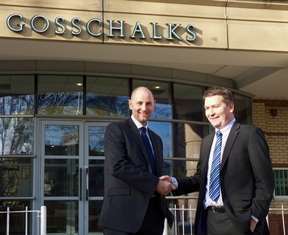 Gosschalks, the forward thinking Kingston upon Hull based law firm, has signed a multi-year deal with award winning legal innovator, Peppermint Technology. The deal will see the firm swap out their Advanced (IRIS) Evolution Practice Management System together with iManage document management in favour of Peppermint’s Legal Service Platform. The Platform, built on the multi-billion dollar Microsoft Dynamics & Microsoft SharePoint Platform, includes Practice, Case and Document Management, CRM and Reporting – all of which is tailored for the modern law firm. Gosschalks, a progressive practice with 125 staff, has always been recognised as a firm leading the way in the use of technology to provide value added services to their clients. The firm has historically developed their own bespoke technology solutions to assist their clients with their day-to-day business process requirements and to make it easier for them to engage and interact with the firm. However, as the deployment of such technology becomes more wide-spread amongst their client-base, this approach is proving difficult to manage. Through their ongoing client review process, it became apparent that they needed a new software platform that could provide additional functionality and also be developed and deployed more quickly. As technology increasingly becomes central to a law firm’s service offerings, Gosschalks has seized the opportunity to take advantage of an Industry Platform with significant investment from Microsoft behind it. The result will be a better client experience delivered in a far more efficient manner. This will allow the firm to deliver a high quality experience while protecting overall profitability. By utilising the Platform’s extensive client centric features, including workflow tool kit, automated document production and legal online services portal, Gosschalks will re-engineer how it delivers a range of services to clients. Together, these features will allow clients and business partners to interact at a time that suits them to get progress updates, create and upload documents, process workflow and access reporting tools etc. whilst enabling the firm to cut administration costs, accelerate and extend service delivery times and provide more choice to clients. The firm has smart and ambitious service delivery ideas that would be unachievable with traditional legal technology, however with the Peppermint Platform these can be realised.